In addition to the 5 times per dollar for Airfare Purchases you normally earn on the Penfed Premium Travel Rewards American Express Card, you can now earn through April 30, 2012, 3 points per dollar on Dining purchases. Apparently this offer was available from February 1st, but I seemed to miss the email. What is so great about this card, besides normally earning 5 times per dollar is that it has no foreign transaction fees. So, while you are doing a bit of traveling you can now use this card on your foreign dining purchases. The sign up promotion for this card is 20,000 points which is not amazing, but considering you get so many miles for your Airfare Purchases I think this is a worthwhile card to have. My normal spend is about $6,000 - $6,500 spend per year on Airline Tickets, which I always place on my Penfed Credit Card. So, about every 2 years per years I can get a free Economy Coach Airline Ticket that also earns frequent flyer miles. Now, if you get friends and family to place their Airfare Tickets on your Credit Card you can earn even more miles! 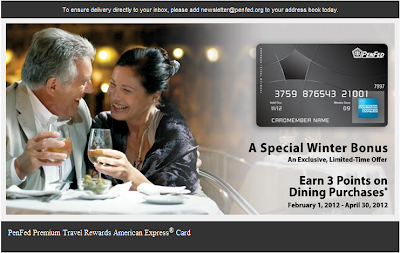 Penfed Premium Travel Rewards American Express Card Click here to apply. In order to apply for this credit card you need to first be part of Pentagon's Credit Union. All you need to do is pay $5 to join their Union and then you can apply for their credit card. Some experts don’t think that this is a good credit card, since you need to purchase the airline/travel purchases through their booking tool. But I think it’s a great deal, if you are willing to buy tickets through them when it’s not high season and only are interested in economy seats. When it’s high season the miles you need are astronomical! But if you are flexible and can purchase your tickets not during high season, tickets cost much less. At the end of 2011 they had a promotion where one earned 25% more on all earnings. So, this card also has great promotions from time to time. Did I mention that this card if free? You heard me right! There are NO ANNUAL FEES!!! To travel round trip from the US to the Middle East for example it would cost 80-90k miles, but as you see above, with this card it is only 62,500 miles. This is only during low season.